Mel Scott is an artist with a curious mind always alert to the newest mediums available. Mel received her Associates degree from Dixie State College and her BFA from Southern Utah University. After graduation she began teaching as an adjunct Professor in ART at Dixie State where she taught for 7 years prior to teaching full time at Tuacahn High School for the Performing ARTS beginning in 2003. She developed a strong art curriculum at THS and eventually became the Art Department chair. 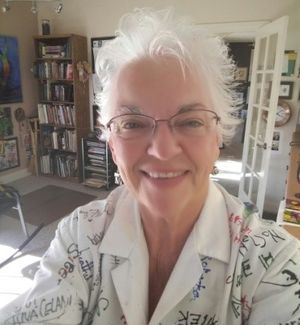 She taught at THS 10 years and retired in 2013 to serve an LDS mission with her husband in Oregon where again she taught drawing and painting classes. She is currently teaching at Dixie State University in the art department. Mel is one of the original founders and the first President of the Southern Utah Watercolor Society in 1999. The SUWA has since changed the name to the Dixie Watercolor Society. She is a Charter member active in GALLERY 35 on Main Street in St. George. Mel is a member of the Southern Utah Art Guild displaying with their members at The RED CLIFF GALLERY in St. George. Mel is currently with the Art and Soul Gallery on Main Street in St. George. She is involved with the SEARS Invitational Art Show at DSU each year. Mel is an active member of the ARTS to ZION which is sponsored by the city of St. George Utah. Mel has received many awards for her paintings. In 2017 she received 3 first place awards one for a watercolor and 2 alcohol ink paintings at the RED CLIFF GALLERY. While at THS she won the American Art Educators award in a competition traveling to Bend Oregon to study with other art educators. The City of St. George has one of her watercolors in their privatecollection. The newest venture for Mel is designing fashions for a worldwide company called VIDA. Her paintings are now on items of clothing featured on the internet and face book at shopvida.com/collections/melartist64. VIDA is collaboration between artists and designers around the world that brings unique, inspiring accessories and apparel to the public. Vida offers literacy, meals, and education programs in factories across the globe.